The last time I was in New York I had dinner at craft. The dinner was part of an event and there was a ton of food. And while the dishes felt a little disconnected they were all good. In addition, the space was warm and welcoming. I liked it a lot and decided that the next time I was in New York I’d try it out under more normal circumstances. On this most recent trip I didn’t have enough time to do all I would have liked and so I wasn’t going to make it back to craft. 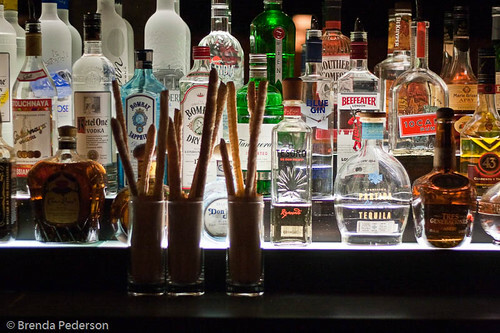 However, I did have an opportunity to visit craftbar for a quick cocktail one evening. Craftbar is quite different than craft in the way it looks and feels. Instead of warm, glowing wood and interesting lighting, craft has hard surfaces. A cement bar, dark chairs and floor. The bar was very dark and the dining area seemed to be lit by spotlights. The whole place felt incongruent to me. The dining room didn’t feel like it belonged with the bar; the bar seemed casual, the dining room more formal; I wasn’t there long enough to really figure it out but it wasn’t a place I wanted to hang out. I ordered a special fall drink they had on the menu, a spiced Manhattan. 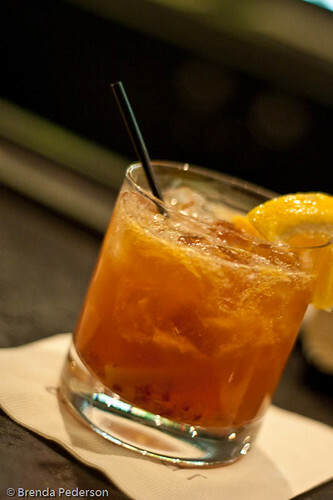 The idea was great – Makers Mark infused with warm fall spices, garnished with an orange slice. It sounded wonderful. But the infusion was way too strong. The spice was so overwhelming as to make the drink rather unbearable. I was very disappointed. I can’t say the place wasn’t good. I wasn’t there long enough and certainly didn’t give the menu any sort of trial. But there are so many great places in New York that I really don’t have time to give any disappointing place a second chance. Perhaps if I lived there I would try it again but I won’t go back the next time I’m visiting.